Geotechnical Engineer Josh Pruett was recently certified as an Envision Sustainability Professional. The Institute for Sustainable Infrastructure created the Envision program to promote sustainability and the responsible use of resources. Josh’s certification recognizes his proficiency in the Envision system, and dedication to sustainable practices. Envision includes design resources and best practices, training and professional certification, and a rating system to certify sustainable infrastructure projects. Bill Wallace, GeoEngineers’ external board member, pioneered the creation of Envision and introduced the company to the program. 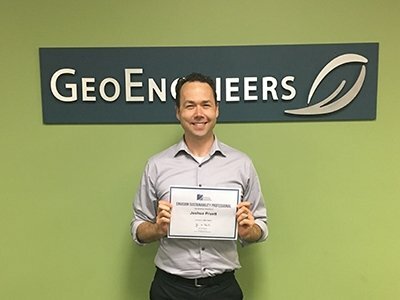 GeoEngineers is a member organization of the Institute for Sustainable Infrastructure, and Josh is the first GeoEngineers staff member to be certified in the program. “The Envision system gives us a framework for thinking about how we can bring projects to the next level. It’s all about improving upon the standard of practice and looking beyond short-term benefits to connect people and structures in longer-lasting, more wholesome, and more resilient ways,” Josh said. Josh expects more GeoEngineers staff to become familiar with the Envision tool. There are a number of ways Envision could add value to GeoEngineers’ services.